A beautiful pale cat sits in the ledge of a window, watching the proceedings below with great dignity. Larger than any normal feline, and as intelligent as any magi, it possesses great magic. Those are not the only differences that mark this creatures apart, though; nestled against its back is a pair of creamy wings. These are silken soft to the touch, feathers as smooth as this cat's fur, and the exact same shade of color as the tips on its ears, and the end of its tail. The large feline turns to regard you, eyes, one green and one blue, full of knowledge. It inclines its head for a pat, rubbing a light-colored cheek against your palm before turning to gaze out the window again. As graceful in flight as when walking, winged cats are stately beings, full of self-importance and pride. They are the favorite pets of the high ladies of Synara, free to roam where they will and treated with the utmost respect. The felines of Etain are their distant cousins, and they spend much of their time together, watching the kittens at play and hunting for small game. 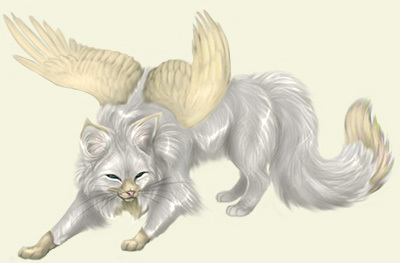 Winged cats are often seen on the roof of The Keep, sunning themselves sleepily, motionless except for a twitch of their tails now and then.